Trout opener, rock and roll, baseball, and new gear I have been using...very stimulating reading. Trout opener is tomorrow…I have never been a guy that gets really excited about the trout opener or heading up to the mountains to trout fish on the opener. It seems like the few times I have made that move I have been utterly disappointed with high water, cold weather, rain, even snow, and lethargic fish…not the vision I place in my mind of fish that haven’t seen flies in months and are awaking from a winter slumber willing to mindlessly throw themselves at my flies. As I have gotten older the opener is more about a theoretical representation or meaning… it is one of the last official signs of spring and means summer is right around the corner. I kinda look at spring along the line of a few milestones…Spring break comes and goes, Baseball season opens, I put my garden in, the shad show up, and the trout opener…That shad showing up and the trout opener are really interchangeable as to when they happen…some years shad first opener second and then others vise versa….Any way if you are heading up or going somewhere for the opener, enjoy your self! Relish in the knowledge that if fishing is not how you frame it in your mind it will be soon! As summer is on its way. Lower Sac Shad…They are here and here in good numbers. Wade fishermen and boat guys are catching fish most afternoons and evenings. Finding a wind free warm day is going to be best. Bit starts around 4pm and lasts until about 730pm…Early start to the season so I imagine it will be good most of May and by early June may taper off. Stripers – With the shad showing up the bite has slowed from what I have seen and heard. While there is always fish around and really all one has to do for fishing to be good is find a few hungary fish with the shad around that can be tough. June-Oct is best and should be great this year! Only a few open dates Left for Summer Fishing! Carp, Largemouth, and Smallmouth on the Lower Sac are picking up as well and this is a great time for a combo shad/bass trip! Lower Yuba River - still high but there is fish around and success seems to be if you find the fish on a given day. I have heard some good reports and had a few good days but have also struggled to find fish at times...Not sure what to think. Bug life is good, fish I have caught seem healthy...Only thing I can think of is it is tough to cover all the possible holding water at the given flows and some days you find'em some days you don't. Wade fishermen have been finding a few risers in the evening and midday but I have not taken the time to search them out. Nymphing with attractor nymphs and fishing streamers has been my go to. Baseball – Giants are fun to watch period…They have had some bumps and ups and downs here over the first month and a sweep of the Padres while the Dodgers get swept by the Marlins is not a bad way to set up the end of April. Pitching is solid but I worry about Cain and Peavey though both have show signs of positive steps forward. All the young arms in the Pen are fun to watch and look great and then struggle at times…In the end a good start to the season and fun to watch a line up like this hit every day. Rock and Roll music…Cleaned up at the record store this last weekend filling out my Bruce collecetion with The River, Darkness on the Edge of Town, Nebraska, Born in the USA, and Born to Run…Been listening to those pretty much every evening this week. I also order the new Sturgill Simpson on vinyl…Kind of a late band wagon guy for Sturgill as I just discovered him with this new album but have been listening to all his old stuff. One of the great things about him is his band! The drummer and lead guitarist are AMAZING!!! Search out some live videos on You tube. Been fishing the new Air Flo Sightfree G5 or Generation 5 sight free fluorocarbon salt and fresh water tippet….I rarely get excited about tippet as I just kinda have always figured if a clients ability to land a fish gets down to the break strength of one companies, say 4X, tippet to another then SO MANY things have gone right that to hell with it if it breaks it was not meant to be. That said the new G5 stuff is really cool. The break strength, per the mad scientist Matt Callies not test, is better then listed on the spool and I must say the competition. What has me really pumped is the diameter and stiffness…the tippet is thiner and moves better then much of the tippet material on the market. With spring in the air it is time for bass, shad, stripers, carp you name it…bigger rods and bigger fish. A few of my recent favorites that are easier on the pocket book are the Scott Tidal and the Echo Boost. I have the Tidal in the 7 and 9wt and for $495 they fish like a $800 rod. The Boost from Echo I have been fishing in the 9wt and is one of my favorite striper rods! For $249 you would be hard pressed to find a better salt or big game rod on the market at that price. Obviously there are some great rods on the market for 700-900$ but most anglers don’t spend as many days with their 7-9wt bass, shad, striper rod so cheaper options that fish great are a good thing! 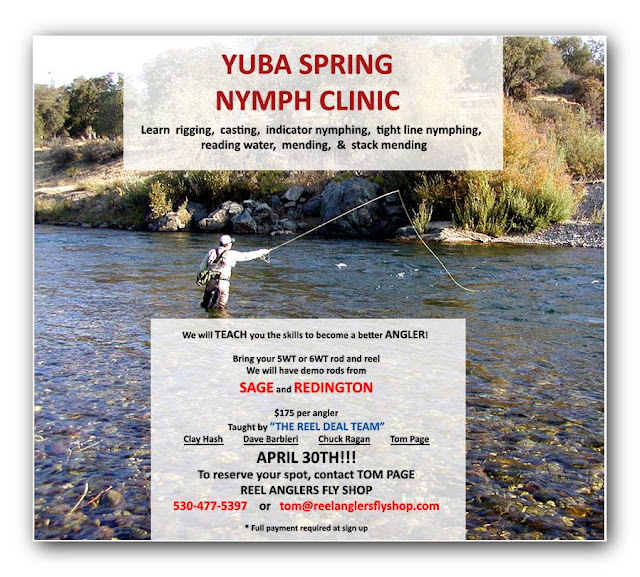 My local home town fly shop Reel Anglers Fly Shop are putting on a GREAT clinic this weekend with my good buddies Chuck Ragan (Official) Dave Barbieri Clay Hash and Tom Page on fishing the Lower Yuba River! So, the weather is all over the place…imagine that it is spring in Nor-Cal. Brings me back to days when we actually had a spring. 80 degrees and gorgeous to 55 cold and rainy in the span of 48 hours. Makes for interesting fishing this really optimistic attitude for May through September to be honest. Last year about this time weather was gorgeous, and had been for a month or so, fishing was amazing but I was feeling this incredible sense of dread for what was to come in June-September with the impending drought…It was hard to revel in the great fishing and weather when I know what the price was going to be. This year I have a totally different attitude. Here is some reports but keep in mind they could change any day…I will be on the water a bit over the next week or two so if something totally changes stay tuned. Lower Sacramento River – Trout fishing has been good to really good…just depends on the day and weather. I have not been up trout fishing much, but everyone I talked to has been doing really good. On over cast days fish are eating the bigger rubber legs and eggs, on warmer sunnier days fish are keying on March brown nymphs, caddis, and PMD’s…Best fishing is from about 9am to 2pm. From Hwy 44 above is closed and be cautious of trout spawning areas as most of the trout are getting up on reds to make babies! Lower Yuba River – Flows are back up to around 4000cfs and I have not heard any good reports. I had a trip or two over there recently that I moved to the feather and Lower Sac. I have done really well in previous years when the flows get down to about 3500-3000cfs, but the one time I rolled the dice and went over the last few weeks we struggled to get fish. I have no idea where the fish are or what is going to happen to the Yuba…I hope for good things but it may be a tough summer as fish get reacquainted and adjusted. Even when I was out there and the flows were around 4000cfs there were hatches of bugs and bug life seemed to be decent. Just need to find the fish and where they are holed up. Lower Feather Spring Steelhead – Flows on the feather are back down to around 750cfs in the low flow and about 1000cfs in the high flow. There is a good amount of spring steelhead, both half pounders and adults up in the river…spread out throughout the low flow and high flow. Nymphing and swinging flies is catching about the same amount of fish to be totally honest so what ever you enjoy do I would say do…nymphing with egg patterns and attractor nymphs like princes, PT’s and such is catching fish. Swinging with small bait fish patterns and attractor nymphs is catching fish. Warm Water Fishing on Rivers,Lakes, and Puddles – Bass and stripers are turning on in the lower sac outside of chico, clarity is fair to good. Fish are most active on warmer days. On warmer days carp are up sunning themselves and one can endlessly frustrate themselves trying to entice one…On most foothill lakes the spots, large and smallmouth bass are getting going from talking to some of my buddies that fish Englebright, Scotts Flat, Bullards, etc. As soon as we get some stable 75-80 degree weather the bass fishing on many of these lakes is going to go off!